I didn’t always consider myself to be an “artist.” Although I get great joy from making things I’ve never felt like I had reached “real artist” status. I’m not a suffering artist or a starving artist. My artwork doesn’t have much of an underlying societal or intellectual meaning. But I do like making my world and the world of those around me a little more pleasant, a little more beautiful. I liked art class in grade school and high school. I was neat and good at following directions, which was basically what it takes to succeed at “art” in the school setting. 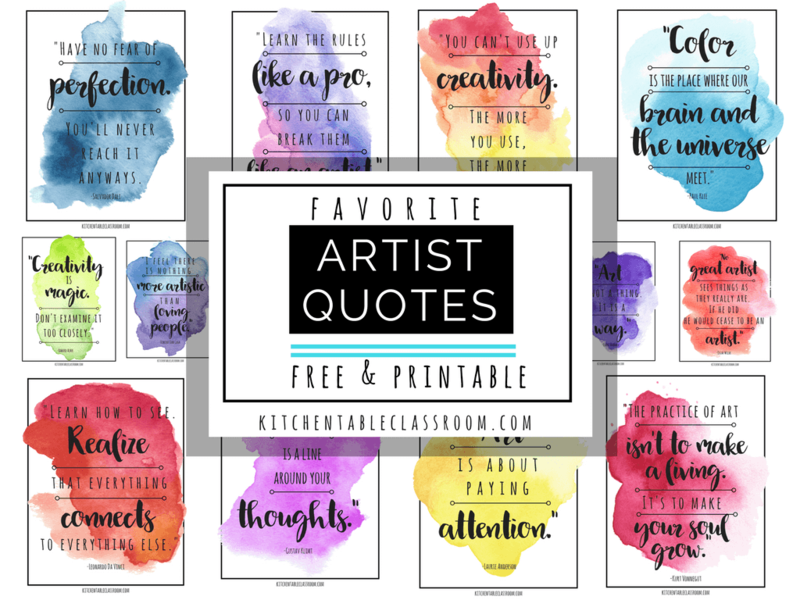 What I love about these famous artist quotes is they inspire us to go beyond the following of directions; beyond the making of a “craft.” These art quotes are there to encourage that little spark of an artist inside of you to take a risk and make something today! 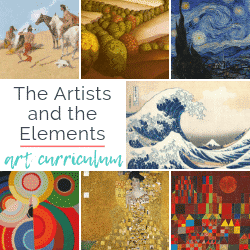 On being an art teacher….. In college I stumbled around a major finally landing on art education. I never had one particular medium I fell in love with and practiced constantly. I made a little bit of this and that out of a little bit of everything. While I sometimes struggled to feel like a legitimate artist in my own right I believe it made me perfectly suited to be an art teacher. Four kids later art has a different purpose in my life. Or maybe it really doesn’t. Maybe I just appreciate the role of creativity a little more than I used to. Making something makes me happy, a little lighter. In a season of life when there is very little “me time” making things is essential to keeping my head above water. I like doing things well; even better is making something “just perfect.” Being a “just perfect” artist (insert the words mother friend, wife, etc here) is darn near impossible. I’ve tried. If you’re a recovering perfectionist artist like I am you might enjoy these quotes about being mindful. They really help me to appreciate where I’m at and what is happening around me! 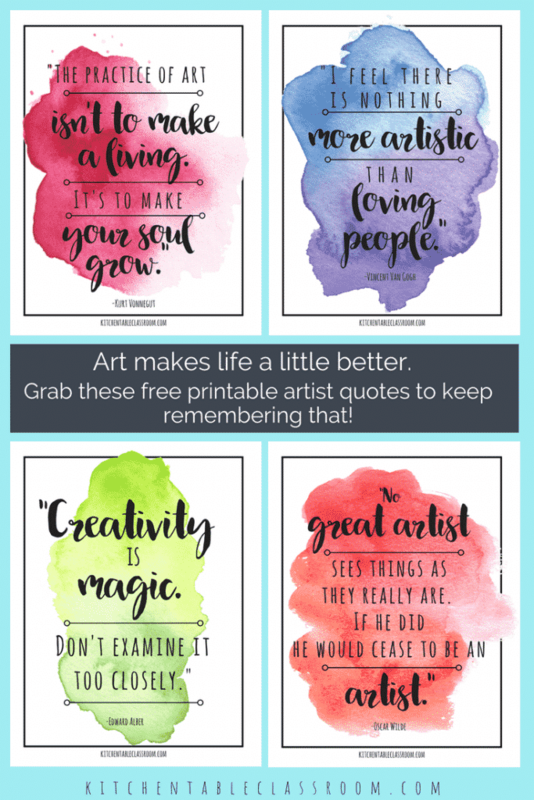 Let these famous artist quotes remind you that even the greatest artist of all time were experimenting and playing with new concepts. Art isn’t a sure thing. It’s a process with ups and downs, no matter who you are. Art quotes that make you pay attention…. I really think that’s the value of art in my life. Pay attention to the little stuff. See beauty where it already exists and maybe even leave things a little nicer than I found them. That is how my idea of “real art” and “real artists” has changed over the years. Art doesn’t have to be saleable or angst filled or have an agenda to be meaningful. It can be anything you want. To this day I do not have a medium that is my one true love. Usually what I make fills a need. My art doesn’t hang on a wall. Taking something necessary and making it more beautiful to use is my favorite. I’m a practical artist. Is that even a thing? Cooking, sewing; anything mundane can be filled with creativity if you approach it in that way. I’m a stay at home, homeschooling, blogging mama. My days are filled to the brim with activities for others. Making stuff is for me. No matter your art of choice, whether you have art hanging in the local gallery, you’re a scrapbook queen, or a baker of treats- it all counts. 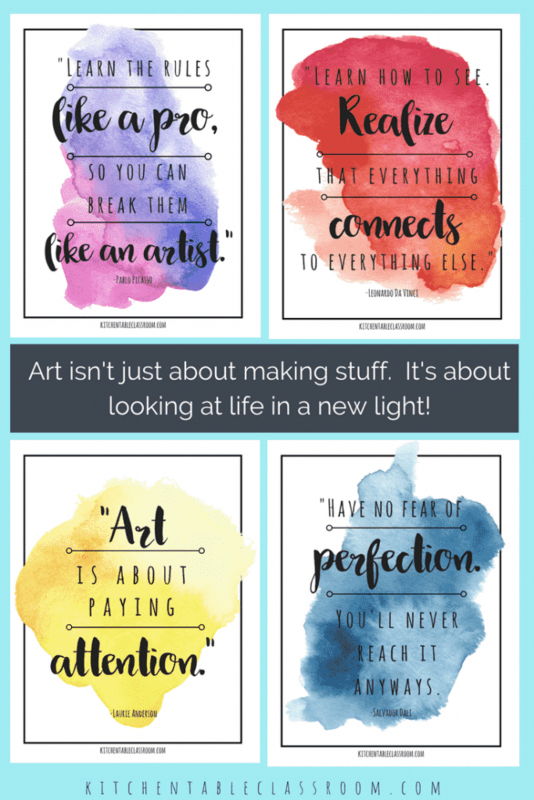 Even if you’re one of those people that swears they don’t have an artsy bone in your body I hope you can find a little inspiration in these famous artist quotes. These are inspirational art quotes from the greats, artists whose work is hanging in museums today. But they are just as applicable and approachable today as they would have been when they were said. Read them, pin them up on a bulletin board, or tuck them in your favorite book as a bookmark. Remember that there is beauty in your way of seeing the world. Don’t be afraid to share it! Upon confirming your subscription to my weekly newsletter a password to my Resource Library will be delivered to your inbox. You’ll get weekly updates with all my newest printables and projects as well as access to the 100+ printables in my library! 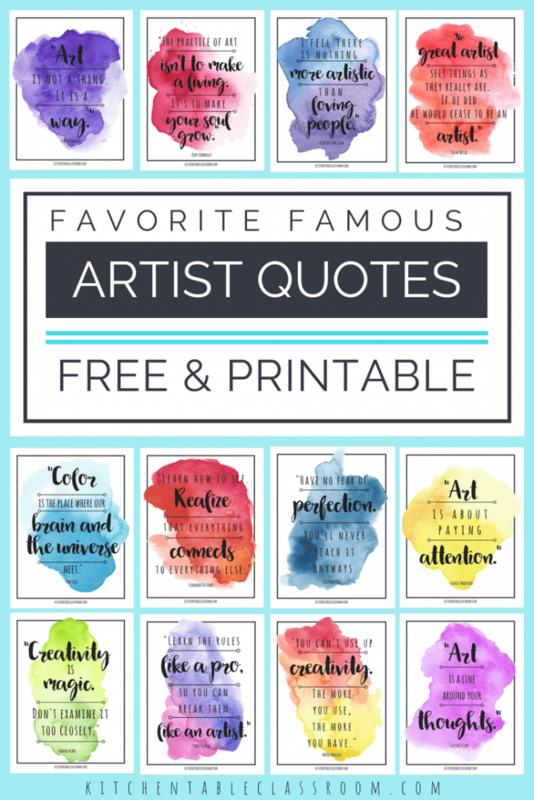 Please share these famous artist quotes on your favorite social media channel using the social share buttons! 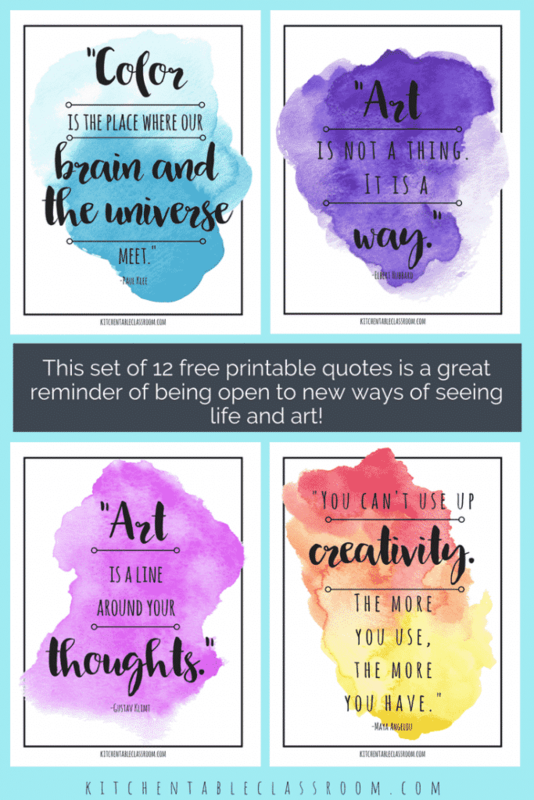 Every single share helps me to bring you more pretty printables like these art quotes and fun projects! These are great quotes. I love diving right into art project along with my boys and we try to make an equal number of project that focus on content and process. Oftentimes it’s just so fun to play around with the supplies and see what we can come up with! Thanks Joanne. I love to join in too- such a stress reliever! These are great, and would really add a nice touch to our annual art show. Each class learns about an artist and then makes then each child makes their own art project in a style representative of the their artist I . do worry about sharing the quote by Salvador Dali — I think our parents would ind some of this work offensive. I am having trouble downloading them. I LOVE these quotes!! Am I doing something wrong? I’m also having trouble downloading these quotes, am I doing something wrong? So here’s what “should” happen. Subscribe using the turquoise form in my sidebar, footer, or most posts. Upon confirming your subscription you will get a password. Go to my resource library, enter the password, click on any thumbnail and the PDF will pop up. If you have any issues with that process send me an email at kitchentableclassroom@gmail.com and I will help you through the details ASAP! Sometimes technology doesn’t work as smoothly as it should!